Capt. 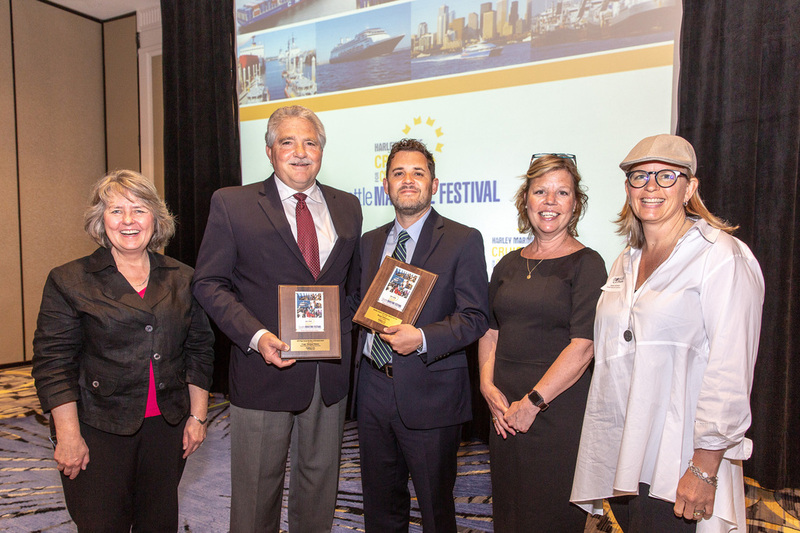 Mike Moore, Vice President of the Pacific Merchant Shipping Association (PMSA), received the annual Puget Sound Maritime Achievement Award, and Roque De Herrera, City of Seattle’s Office of Economic Development, received the Public Official of the Year Award at the annual Harley Marine Seattle Maritime Festival Breakfast this morning. 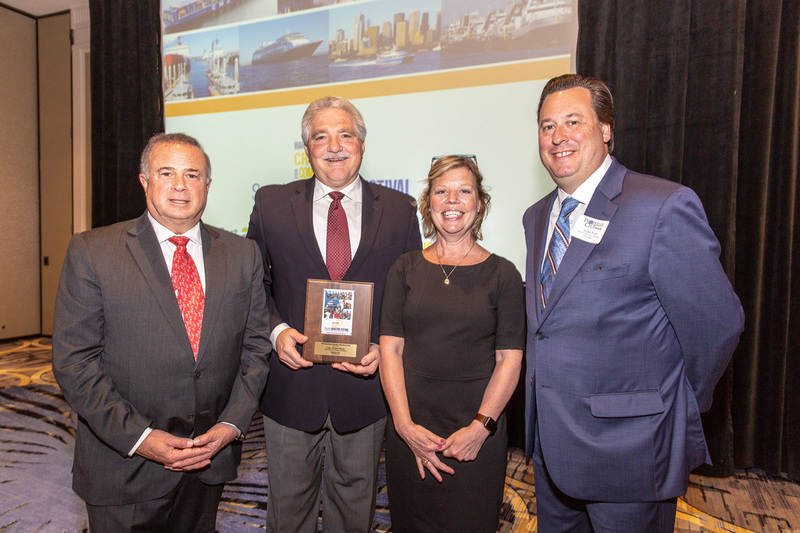 Moore was recognized for his “outstanding professionalism and commitment to improve the maritime industry in all safety matters,” said Susan Chesney, President, Seattle Propeller Club, which presents the award during the region’s Maritime Week celebration. “When Seattle’s rapid growth and booming economy placed unique pressures on the maritime industry, Roque worked to solve many of the most difficult questions of land-use, manufacturing, and economic diversity,” Chesney said. Capt. Moore joins respected maritime industry professionals and public officials who have received the award since 1951, including representatives of steamship lines and agents, tug and barge operators, passenger vessel operators, ports, stevedores, shipyards, labor and government. Moore has directed PMSA’s Pacific Northwest operations since retiring from the U.S. Coast Guard in 2002. He graduated from the Coast Guard Academy in 1977 and was promoted through the ranks to Captain of the Port stationed in Seattle. He earned an advanced degree in marine affairs from the University of Washington. 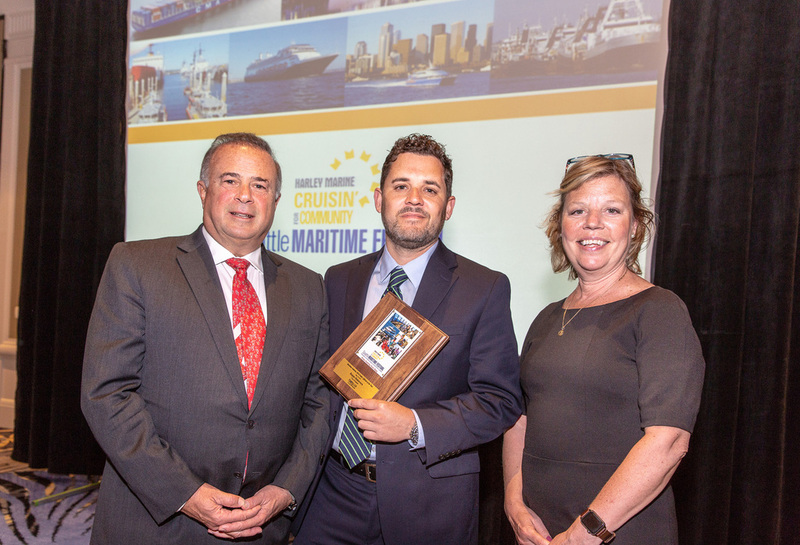 Chesney said the Public Official of the year award recognizes the contributions and support of a local, state, or federal policymaker who has demonstrated leadership, understanding, and appreciation of the maritime industry. For over twenty years, De Herrera has made a career with the city as a planner and a business advocate. “Whether it’s fire and safety issues, stormwater, marine infrastructure, or protecting shipyards, Roque has thrown himself into every project with honesty, passion and dedication,” said Chesney. The Harley Marine Seattle Maritime Festival is the largest industry celebration in the region. More than 200 industry leaders attended the annual breakfast at the Downtown Waterfront Marriott Hotel on Friday, May 18. For more about the Festival, click here. To learn more about the Seattle Propeller Club, click here. The Ballard Locks are busiest in the nation! A century of service, but the future??? The Ballard Locks serve more individual vessels than any other locks in the nation: more than 40,000 transits in 2015, and more commercial vessels than all but 12 of the 200+ other USACE locks. That’s just one of the key findings of the Economic Impacts of the Hiram M. Chittenden Locks analysis published in June 2017. The study was funded by a unique and diverse funding group, the Lake Washington Ship Canal Users Group. This year marks the 100th anniversary of the Locks’ opening day in 1917, and as the Locks reach this important milestone, there is growing concern about making the critical infrastructure upgrades needed for the Locks to continue operating reliably and safely. This report discusses the benefits of reliable Locks operation, the potential losses in the event of a closure, and describes some of the steps needed to mitigate these risks. To read the results of the Study, which was conducted by the McDowell Group, click here. “Ties that Bind” is report by the McDowell Group that documents the dynamic and diverse economic relationship that grows stronger each year between Alaska and Puget Sound. Just as Alaska is economically dependent on Puget Sound as a service, supply, and transportation hub, Puget Sound derives billions of dollars in economic benefits from its powerful connections with Alaska. Those connections include the movement of millions of tons of freight and millions of passengers between Alaska and Puget Sound. Puget Sound provides essential support to Alaska’s seafood industry and other maritime sectors, as well as a critical market for Alaska’s crude oil. Important links in health care, education, and other sectors are all part of the fabric that connects Puget Sound and Alaska. Heather Haugland, McDowell Group Senior Project Manager, presented the report to the Seattle Propeller Club. Below you can download the presentation which highlights key report findings. "As the second day of Seattle’s Pacific Marine Expo kicked off Thursday, the buzz among the attendees — fishermen and legislators alike — was a newly released economic report boasting of Washington’s $30 billion maritime industry. "In the state, a maritime industry that traces its roots back to Hudson’s Bay Co.’s commissioning of the S.S. Beaver, the first steamship in the Pacific Northwest, generates $15.2 billion in direct revenues and is responsible for 57,700 jobs. "When combined with indirect revenues, the numbers increased to $30 billion and more than 148,000 jobs in 2012, according to the comprehensive study commissioned by the Economic Development Council of Seattle and King County and the Workforce Development Council of Seattle-King County." More than 50 fishing industry leaders attended a breakfast at Ivar's Salmon House on August 28th to help launch the release of the Alaska Seafood Marketing Institute's (ASMI) report on the economic value of Alaska's seafood industry. Andy Wink of the Alaska-based research firm the McDowell Group presented data from the report, the first of its kind, showing the economic importance of the Alaska seafood industry on the rest of the country, specifically the Pacific Northwest. The North Seattle Industrial Association, King County Maritime, Port of Seattle, Pacific Marine Expo, ASMI and Ivar's hosted the breakfast.